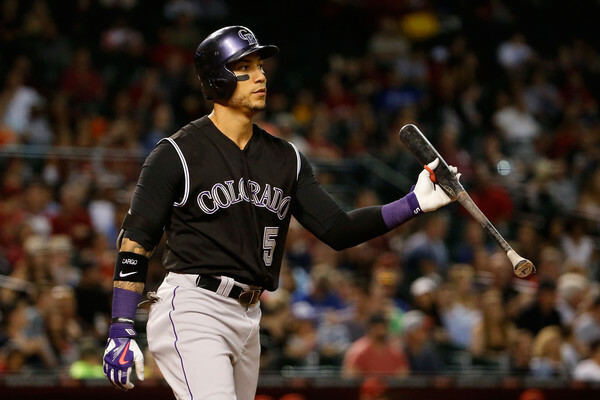 Carlos Gonzalez is the most talented and tradable player in the trade market. The Rockies need to ship him out if they’re serious about their rebuild (still TBD) and there’s plenty of teams in need of a lefty power bat. The Orioles, Nationals, Mets, Angels, Cardinals, Indians and White Sox could all use Gonzalez’s talents but few of them have the prospects that Rockies GM Jeff Bridich is asking for in return. The Nationals, Cardinals and Indians have the trade packages that fit what the Rockies are looking for, but there’s one team that’s ready-made for a big trade. SBNation’s Purple Row outlined a possible trade with the Nationals involving CarGo and All-Star second baseman D.J. LeMahieu, filling second base and a lefty power bat that Washington desperately needs. Lucas Giolito, the Nationals top prospect and 3rd Overall prospect on the MLB 100 list, finished the season at AA and will be MLB ready by the Rockies targeted contention date in 2017. He features a triple digits fastball with a power curve and finished 2015 with 131 strikeouts in 117 innings. He’s a true ace that the Rockies need if they ever want to compete in the NL West. If the Rockies can get him back in any package it’s a win. It just makes too much sense, and I’ve written about both possible factors ad nauseum. The Cubs now have a surplus of fine outfield bats, and the Indians have a surplus of starting pitching. What does each team need? The Cubs don’t need another starter, but one sure wouldn’t hurt, and the Indians are in desperate need of an extra bat that isn’t Mike Napoli or Rajai Davis. So what do you do? Theo Epstein recently told 670 The Score that Jorge Soler is part of the Cubs’ plans for 2016, which as a Cubs fan is exciting; Soler’s upside is through the roof, and he hasn’t tapped into his power just yet. However, Theo also said Rick Renteria would manage the Cubs in 2015, and you know how that turned out. I tend to think nothing is off the table, such is the case on the open market. Cleveland on the other hand has made it known that Carlos Carrasco’s trade value is through the roof, rightfully so, so let’s set our sights on the 24-year-old Danny Salazar, another member of Cleveland’s esteemed young rotation that isn’t yet as sharp as Carrasco. Salazar would have little pressure as a number-three or four starter in a Cubs rotation that boasts Jon Lester, Jake Arrieta and Kyle Hendricks, while Soler enters a lineup with Michael Brantley, Francisco Lindor and Jason Kipnis. It’s a win-win for both sides, as both teams have pieces to move on just fine without each. Following the trades of both Craig Kimbrel and Joaquin Benoit, the Padres last real valuable, tradable asset is pitcher Tyson Ross. Coming off a season in which he finished in the Top 20 of pitching WAR in all of baseball, Ross’ value has never been higher. Entering his second to last season before he is eligible for free agency, that trade value may never be higher. The Padres clearly need to recoup some of the lost value from last year’s offseason disaster, and Ross is the best way to do that. While the team would rather trade James Shields and the large sum left on his contract, Ross has much more value, and will net the team a much more extensive return. As for the teams that could be interested, there is no shortage of teams that has been linked to the Padres right hander. At the top of that potentially long list, are two teams that make the most sense: the Houston Astros and the Chicago Cubs. The Cubs have seemed unclear on whether they wish to part with the required talent to get a deal done, and the Padres are reportedly asking for a “monster package” in return. The Cubs have seemed more focused on the Cleveland Indians pitchers, specifically Danny Salazar and Carlos Carrasco, which makes the Padres a questionable fit at best. Obviously the Padres wouldn’t mind acquiring Javier Baez or Jorge Soler, but it remains unclear whether that can happen. Instead, a better fit for a Tyson Ross trade is the Houston Astros. Following the trade of Vincent Velasquez, and the loss of Scott Kazmir, the Astros really lack a proven #2 pitcher behind Dallas Keuchel. With the acquisition of closer Ken Giles, the Astros have shown that they are not afraid of giving up talent in order to acquire talent. Given his minimal years of control, Ross would not command quite the package that Giles did, which could further entice the Astros to make a deal happen. The Astros have the young depth the Padres crave, and the Padres have the pitcher the Astros may want. I am choosing two trade partners who perhaps are both a little desperate. The Rockies have a mess of a roster and have the same problem they have had for years – not great pitching. Yes, it does have to do a lot with their home ballpark but for whatever reason, they can’t find a pitcher who is great on the road, either. They have Carlos Gonzalez, with two years left on his rather big but fairly reasonably contract. His 114 wRC+ included with his Silver Slugger award from 2015 should make him an attractive piece for the right price to a team looking for offense. The Cleveland Indians were supposed to be in contention last year but their offense stagnated, mainly due to an outfield that did not meet expectations. They have a plethora of young pitchers that are under team control and so far they have not looked to be interested in parting with them. The nasty thing about a young pitcher core is that they will not stay that young forever. The Indians window will not last long and they should try to take advantage while they still can. Danny Salazar’s 9.5 K/9 ratio should be mighty attractive to Colorado, who is in need for a strikeout pitcher. I propose that the Rockies and Indians make a swap headlined by Danny Salazar for Carlos Gonzalez. Michael Brantley’s injury may keep him from being ready by opening day and in a division that is getting stronger over the offseason, the Indians need to try to keep pace. The signing of Mike Napoli may restrict Gonzalez to actually play the outfield, something he did not do well last year, but the offense should make up for it. The Rockies get a young pitcher to start building around and hope they can hit on some youngsters to follow up a new potential ace to their rotation. Back in November I pondered five potential players that could be had in a trade this offseason. Two of them, in the shape of Ken Giles and Starlin Castro have already been moved, so naturally I should dip back into my metaphorical bag of players and pick one more to be on the move this winter. Tyson Ross, come on downnnnnn!!! Ross is a cost-controlled, frontline starter in his late 20’s. It will be a ransom the Padres eye in return, but with the free agent market thinning down to Mike Leake, Scott Kazmir and Wei-Yin Chen, I’m sure there’s a myriad of clubs circling like sharks around A.J Preller enquiring on Ross’ availability. Every team with a realistic opportunity to contend will have some degree of interest in the right-hander, but the package of prospects, the “win now” mentality a la the Arizona Diamondbacks and the glaring need in the rotation all add up in a neat little venn diagram to provide, to me, the obvious trading partner: The St Louis Cardinals. The redbirds lost John Lackey to the hated rival Cubs. They lost Jason Heyward to the hated rival Cubs. They lost NL Central favouritism with the bookmakers to the hated rival Cubs. They lost in last season’s NLDS to the hated rival Cubs. They…you get it, it’s been a rough few months for the normally satisfied Cardinals. The 2016 rotation comes with question marks for the club. Lackey gone, Adam Wainwright only healthy for 28 innings last year and, there’s a very real possibility that the Cardinals are five pitchers deep with no real help when injuries inevitably come. In top prospect Alex Reyes they have a clear and obvious centrepiece for a trade, in Tim Cooney they have a young pitcher who could potentially slot in the 2016 rotation for either club, although the rebuilding Padres could be deemed a better situation for his nurturing and development. In young outfielders Nick Plummer and Magneuris Sierra there’s a decision on which the Padres scouting network prefers and that could complete a plausible 3-for-1 trade to give the Cardinals a boost to continue their historical dominance of the now scary Cubs. What trades do you want to happen this offseason? Let us know in the comments section below. Let us know what trades you would like to see this offseason on Twitter@CTBMLB or on our Facebook page. You can find links to all our writers work and how to contact them on our writers page.